P&G showed once again its ongoing committment to the Hispanic/Latino community by being one of the main sponsors of the 2006 LULAC National Legislative Awards Gala, which took place on Wednesday, March 1, 2006 in Washington, DC. The League of United Latin American Citizens (LULAC) is the oldest and largest Latino civil rights organization in the United States. LULAC advances the economic condition, educational attainment, political influence, health, and civil rights of Hispanic Americans through community-based programs operating at more than 750 LULAC councils nationwide. MidwestLatino was able to bring again world class performers to Cincinnati this past weekend. After Grupo Niche and Oscar D'Leon last year, thanks to Raymond Walters College, we had the pleasure to start 2006 by listening to incredible Latin Jazz concert: "The Latin Side of Miles Davis & John Coltrane" performed by Conrad Herwig and Brian Lynch, supported by set of awesome Latin Jazz musicians, such as Mario Rivera, Edsel Gomez, Luques Curtis, Pedro Martinez, and Robby Ameen. But the night was not over yet, and after Latin Jazz it was time for Salsa @ the 20th Century with Salsa Caliente, celebrating Mardi Gras, and with Jesus from Latin Underground as a DJ. Salsa Caliente will be perforforming soon at the new Havana Martini Club on Saturday, March 25, another event sponsored by MidwestLatino. 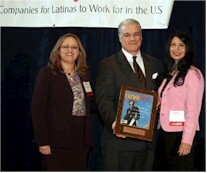 For the seventh consecutive year, Procter & Gamble was chosen by Latina Style as one of the Best 50 companies for Latinas to work for in the U.S.
Lourdes Ribera, NA MDO External Relations, and Marina Anderson, NA MDO Consumer & Market Knowledge, accepted the award on behalf of the Company. Secretary of Labor, Elaine Chao, gave the keynote address. Following the awards ceremony, there was a debriefing at the White House by senior officials of the Bush administration. The guest speaker was Anna Escobedo Cabral, Treasurer of the United States. Prior to the Awards Luncheon, Latina Style hosted a Best Practices in Diversity Conference, which addressed companies' concerns and profiled some of the most successful programs of the Latina Style 50 companies. Marina Anderson represented P&G as one of the panelists for the Recruitment, Promotion and Retention session. The Latina Style 50 awards ceremony brought together the top Latinas in corporate America, at the White House, and in the Federal government as well as influential leaders of the Hispanic community. Attendees at the conference were Corporate CEOs, chief diversity executives, marketing and human resource officers, Latina entrepreneurs, government decision-makers, and other national experts on diversity in the workforce. The annual national listing of the fifty companies providing the best professional opportunities for Latinas is the most respected evaluation of corporate America's policies and practices as they pertain to Hispanic working women. The list is the result of an extensive search involving more than 600 of the most respected corporations in the United States. There are several activities planned in the upcoming weeks in support of a Comprehensive Immigration Reform. Members of the Cincinnati Coalition for Comprehensive Immigration Reform are working with Cincinnati, Ohio, and US legislators in support of the reform. Cincinnati Councilman, Cecil Thomas, is planning to discuss an immigrant worker resolution, sponsored by Council Member Crowley, in the committee Cecil Thomas chairs, the Law and Public Safety Committee. The meeting will take place of February 28th at 2pm in Council Chambers, 801 Plum Street, 3rd floor. Anyone interested in voicing their opinions on the resolution is encouraged to attend the hearing and let the committee members know how they feel. Interested persons simply need to attend the hearing and fill out a yellow speakers card, they will then be given 2 minutes to speak. Plaza del Sol (www.plazadelsolniteclub.com) hosted a great concert of "Grupo Mandingo" this past Sunday. Detroit had its best Salsa party ever with the legendary El Gran Combo, and the excellent local Orchestra Sensacional! opening for them! All thanks to efforts of Tres Rumberos Productions. Also present was Sammy DeLeon, Midwest's #1 Timbalero. Also Cincinnati's Mayor, Mark Mallory, proclaims this week as NATIONAL LULAC WEEK in the City of Cincinnati. With approximately 115,000 members throughout the United States and Puerto Rico, LULAC is the largest and oldest Hispanic Organization in the United States. LULAC advances the economic condition, educational attainment, political influence, health and civil rights of Hispanic Americans through community-based programs operating at more than 700 LULAC councils nationwide. The organization involves and serves all Hispanic nationality groups. The Mission of the League of United Latin American Citizens is to advance the economic condition, educational attainment, political influence, health and civil rights of the Hispanic population of the United States. For more information about becoming a member of a local LULAC Council near you see the map of LULAC Chapters. As we've reported earlier (read here), Butler County Sheriff Richard K. Jones is seeking from Federal Government compensation for housing Undocumented Aliens in Butler County Jail. Also present were (alphabetically): Michael Beck (MidwestLatino), Francisco Caceres (Nuestro Rincon), Neil Comber (Cincy-Cinco Festival), Karen Koch (MEMI), Maria Lang (CPS), George Perez (The Spanish Journal), Greg Stewart (University of Cincinnati), Janet Walsh (CPS), and Ken Williams (CPS). El Día de los Niños, Children’s Day, is traditionally celebrated in Latin America and many Asian and European countries to honor and commemorate the essential role of children in the future of every nation. Initiated by the National Latino Children’s Institute in 1998, the U.S. Senate passed Resolution 278, declaring April 30 El Día de los Niños: Celebration Young Americans. At present it is celebrated in many cities in over 30 U.S. states. Read more... | 2892 bytes more | Comments? Kentucky Governor Ernie Fletcher invites MidwestLatino to participate in the ceremonial signing of the Commonwealth of Kentucky’s Affirmative Action Executive Order. On Feb. 8th, 2006, P&G hosted an Ethnic Summit for its employees, suppliers and agencies involved in marketing of P&G products to the African American and Hispanic communities. Participants were able to exchange experiences, share best practices, and learn from each other. The Summit ended with "2006 Ethnic Brand Building Awards", celebrating the powerful connections that many P&G brands have made with the ethnic consumers and shoppers. Singles Valentine's Day Party at ARGENTINE BEAN! Inner Circle Social Collective is sposoring a singles Valentine's Day Party on Feb. 14, (Valenitne's Day) at Argentine Bean in the new Crestview Hills Shopping Plaza from 8:30-10:00.